Born in Montreal in 1954, Mary Ellen Davis has lived in France and in Québec. After graduating in Film Production (Fine Arts, Concordia Univ. ), she made a short film about Montreal jazz musician, Nelson Symonds Jazz Guitarist. 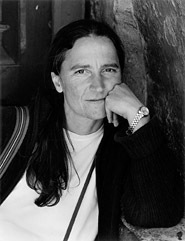 She traveled several times to Guatemala, where she filmed a 16mm documentary, The Devil's Dream (1992), and later Tierra Madre (1996). Both films denounce the profound injustices that plague the country, while honoring Guatemalans and their cultures. They won several awards, as well as widespread recognition inside and outside of Québec. With the same inspiration, Davis directed Mexico: Dead or Alive (1996), about political violence and the fight for democracy in that country. She helped produce Alejandro (1994), a feature-length film by Salvadoran director Guillermo Escalon. In 2001, Davis releases a third documentary about Guatemala: Haunted Land, an exploration into the historic memory of Mateo Pablo, a Chuj Maya and a survivor of a 1982 massacre committed by the state troops, who travels back to the site along with Daniel Hernández-Salazar, a Guatemalan photographer. This documentary also receives local and international recognition. Since 1997, she works part-time as program advisor for Montreal's First Nations film & video program within Festival Présence autochtone, along with Land InSights director André Dudemaine. In 1999, Davis becomes part-time teacher at the Mel Hoppenheim School of Cinema (Fine Arts Faculty, Concordia Univ.). In 2007 Davis completes three projects: Territories, a documentary about photographer Larry Towell, member of Magnum Photos; Los Músicos, a documentary about musical traditions in Mexico; and a short experimental documentary co-directed with José Garcia and Will Eizlini, A Day in Palestine.